Had a tree cut down recently? We bet there’s an unsightly stump leftover in the middle of your yard. We can take care of that for you! Rock’s Tree Service is one of the leading arboriculture companies in the Ottawa Area, with 15 years of experience in the tree service industry. Whether you took the tree down for safety reasons or it fell in a storm, staring at the leftover stump is always a sad sight. Rock’s has been serving the local area for years, having helped the people of the Capital Region clean up their yards. We are a family-owned and operated company that believes in caring for trees. We offer efficient, safe, and affordable stump grinding services to free up space and beautify landscapes. Our tree expert will be in and out before you know it, skillfully grinding the stump down with professional equipment and cleaning up the leftovers. People, particularly children, don’t normally keep their eyes open for things while running around. Going full speed and tripping over an unseen stump is a guaranteed injury. With equipment, such as a lawnmower or even automobiles, small stumps can lead to major damages. It’s best to free up the space for something more pleasant. There’s a good chance that sprouts will spring up around the base of a tree. Before you know it, you might have yourself a new forest growing in the front lawn. The goal of getting rid of the stump from your property is to improve the look of your lawn. That’s why we take extra care to keep your lawn looking beautiful. Our stump grinders are equipped with the latest technology, meaning we’ve got chippers with advanced shock-absorbing tires to help minimize the impact on the surrounding area. We also have mats that we can place to cover up some of the more sensitive areas of the lawn. When it’s all said and done, we will remove the debris and clean up the area, leaving a neat space with no extra damage. You can easily cover over the area with new grass, and everyone will be none the wiser. 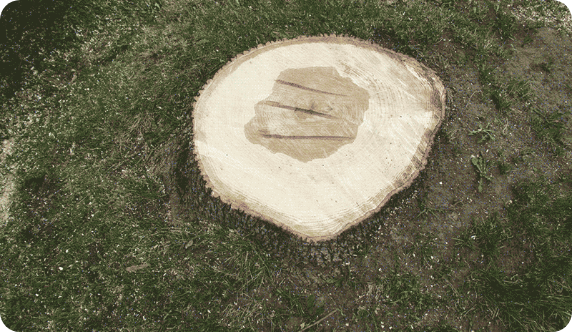 Rock’s Tree Service is Ottawa’s go-to provider of stump grinding services for commercial and residential properties throughout the area. Our services are valued because of our dedication to preserving the beauty of Mother Nature and for the high level of customer satisfaction we provide. Contact us today for your free estimate! Rock’s Tree Service uses this specialized equipment to grind stumps up to 12 inches below ground surface. The machine we use is 34 inches wide, so we generally need a 36- inch clearance space to get into backyards. If you’re located in Ottawa or the surrounding area and need stump grinding services, please give us a call at 613-725-7644 for a free estimate.